This is the valence panel as it came off the truck. 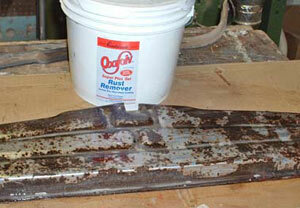 The first step is to scrape away as much loose rust as possible with a wire brush. This panel was in pretty poor condition. One side (unfortunately the one no one sees) was in decent condition, but the "presentation" side had corrosion and deep pitting, so the first step was to get it as clean as possible on both sides. The panel has a 90-degree flange running around, so we mounted a stiff wire brush on the drill press and quickly scraped away most of the loose rust. 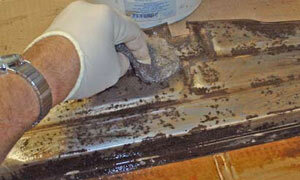 We attacked the ribbed portion of the valence with a hand-held wire brush. The flat portion of the panel (actually, it's ribbed) was first attacked with a hand-held wire brush. This was necessary to break the loose corrosion free before sanding. We then hand-sanded the surface on both sides of the panel, using 100-grit paper and a dust mask, because rust-dust leaves a foul odor in your nose for several hours afterward. 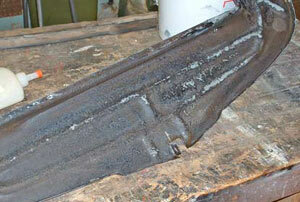 We also scrubbed the ribbed areas with coarse steel wool. Once the panel was as clean as possible we brushed both sides with a generous coat of Eastwood's Oxysolve rust remover and left it for a couple hours. 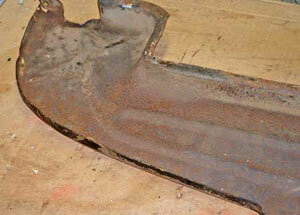 Before washing it off we scrubbed the panel with some coarse steel wool to work off any residual loose rust. 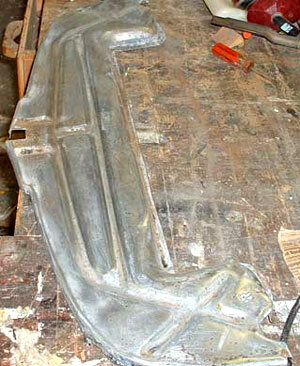 After wire brushing, we brushed on a generous coat of OxiSolv rust remover and let it stand for a couple of hours. After treatment we had a panel that was stabilized, but not particularly pretty on the visible side. 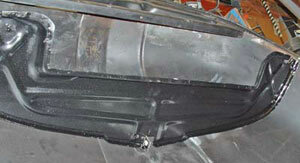 The rear side looked reasonably good but the side anyone would ultimately see remained quite pitted. 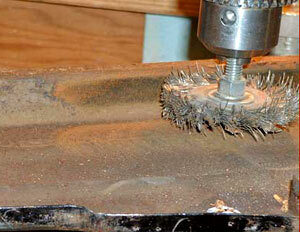 After using the chemical rust remover, we scrubbed off any residual rust with coarse steel wool. The rear side of the valence cleaned up nicely. 2. Should we spray it with a heavy coat of filler/primer to build up surface? No, we didn't want to set up the equipment and waste a lot of material, not to mention take the time necessary to clean the gun later, for the same reason as above. Sanding would still be necessary. The rust on the front side of the valence has been stabilized, but it's still ugly. 3. Should we just leave it alone and hope no one notices? No, because we would notice it. 4. Should we replace the panel? No, we've spent considerable time on it thus far and it would cost too much money to find a replacement. That left one pretty reasonable option: Since we planned to paint the underside of the hood in a semi-gloss black rather than body color, the components would be less visible and would require less surface perfection. Therefore, why not powder coat the panel with semi-gloss black? Since each application of powder acts as a [relatively thick] filler, couldn't we coat in several layers to fill in the pitting? The valence reattached to the hood. Why not indeed! That's what we did and the piece came out just fine. All we did was clean the panel and put on several layers of powder. We didn't let the piece cool between coats, so overall baking time was minimized. The whole process took about an hour and a half and left us with a very presentable panel, don't you think?.